The dreaded off-season has arrived. But fear not, despite news being a little slower this time of year, we have plenty of content to keep you occupied here at BlogToBlogChamps. Each Monday, we’ll publish a feature from the 2013 York Revolutionary Times, the official game day magazine of the York Revolution for you to re-enjoy, or read for the first time in case you missed it at the ballpark. We’ve written extensively about Scott Rice on the blog, and this week, we re-visit a conversation with him in Philadelphia from April as he finished his first week in the big leagues. Rice, who’s stellar season was cut short by a hernia injury on September 6 was officially transferred from the 60-Day Disabled List back to the Mets 40-man roster on October 31 shortly after his surgery, which bodes well for his roster spot in the Majors come next season. 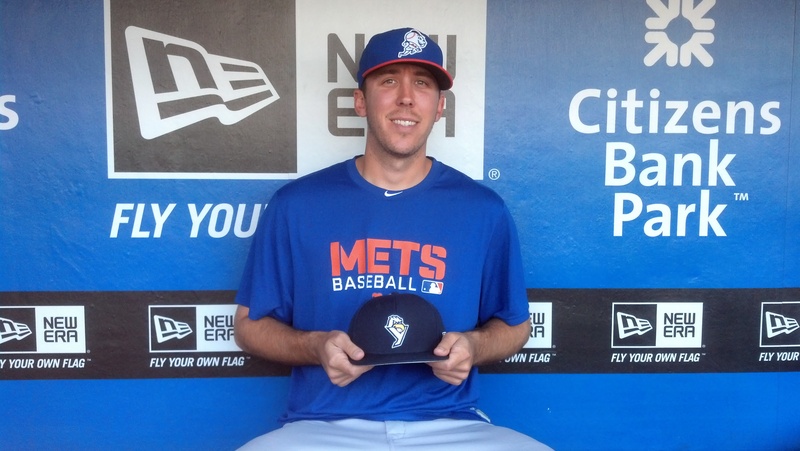 After 14 minor league seasons playing for 18 different teams, relief pitcher Scott Rice finally cracked a Major League roster coming out of spring training this year with the New York Mets. The 31-year-old and former York Revolution left-hander had the distinction of being the oldest rookie on any Major League roster to begin this season. After being drafted by the Orioles in 1999, Rice made his big league debut on Opening Day at Citi Field, and retired the Padres in order for a perfect ninth to close out an 11-2 Mets victory. Rice struck out the first two big league batters he faced swinging. They’ve written baseball books and made baseball movies about much lesser stories. But Scott Rice is hardly doing this for the fame. If you play in York, you’re always a Revolution alum, no matter how brief your tenure. Therefore, here’s some Josh Judy news despite his four all-time appearances in a York uniform. The free agent right-handed reliever has signed with the Dodgers, and will head to MLB spring training as a non-roster invitee. Judy spent the bulk of last season with the Angels, split between Triple-A Salt Lake and Double-A Arkansas. The results weren’t what he, or the Angels were looking for – he posted a 7.01 ERA in 15 games at Salt Lake and a 6.50 at Arkansas in 18 games. In both stops combined, he struck out 29 and walked 15 in 34.2 innings, and converted seven saves. Judy earned a new contract with the Angels on May 2, and was the first Rev to do so in the 2013 season. In his four games with York, Judy tossed four innings striking out five with a walk. He allowed just three hits and a run. It’s great to see him get another chance with the Dodgers as he attempts to regain the form that saw him reach the Majors with the Cleveland Indians for 12 relief appearances in 2011. Lancaster, Pa. – The Atlantic League of Professional Baseball today announced the alignments of its Liberty and Freedom Divisions for the 2014 season. The Somerset Patriots will join the Long Island Ducks, Camden Riversharks and Bridgeport Bluefish in the Liberty Division; the Southern Maryland Blue Crabs will join the Sugar Land Skeeters, Lancaster Barnstormers and York Revolution in the Freedom Division. The Atlantic League of Professional Baseball Clubs is the highest level of professional baseball, other than the Major Leagues. Atlantic League players are experienced professionals, having progressed through the development levels (Single-A, Double-A, Triple-A) and are all “Major League Ready, ” with approximately 40% of Atlantic League players having Major League service time. Since the League’s inception in 1998, nearly 30 million fans have attended an Atlantic League game in one of the League’s state of the art ballparks. The dreaded off-season has arrived. But fear not, despite news being a little slower this time of year, we have plenty of content to keep you occupied here at BlogToBlogChamps. Each Monday, we’ll publish a feature from the 2013 York Revolutionary Times, the official game day magazine of the York Revolution for you to re-enjoy, or read for the first time in case you missed it at the ballpark. This week, we look back at the annual formation of the Long Island Storm, a spring training barnstorming team made up primarily of Atlantic League players, who travel around Florida in March playing collections of MLB minor league players to prepare for the season. The most recent team featured three members of the 2013 York Revolution. 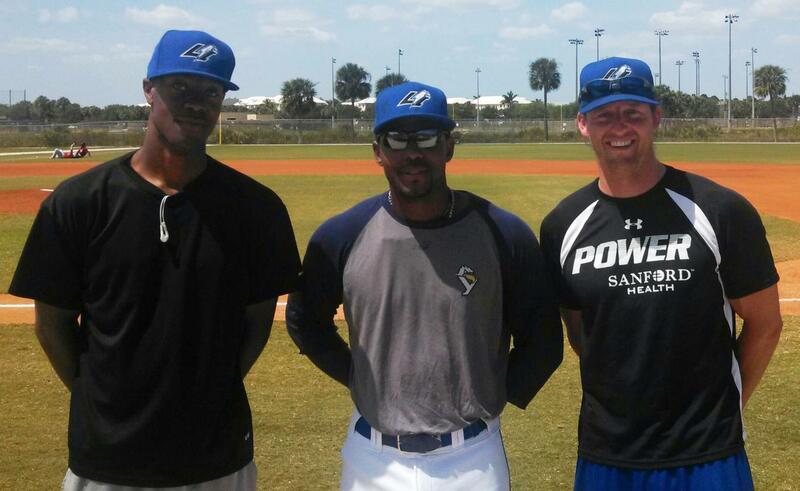 Starting pitcher Nick Green, second baseman Andres Perez and relief pitcher Kris Regas. One of the challenges for players early in an Atlantic League season is short spring training. Typically only 10 days in length, it allows just enough time to move into their new home, meet their new teammates, and mix in a few workouts and exhibition games, weather-permitting. But one of the best spring traditions, and best kept secrets around the Atlantic League for that matter is the Long Island Storm, a travel team comprised of many familiar Atlantic League names, which travels around Grapefruit League spring training complexes each March in a series of exhibition games on the minor league fields. Sunday, April 27 vs. Camden, 2 p.m.
Thursday, May 8 vs. Bridgeport, 11 a.m.
Thursday, May 29 vs. Somerset, 11 a.m.
Wednesday, July 23 vs. Camden, 11 a.m.
Sunday, September 14 vs. Long Island, 2 p.m.
For the full calendar view with home and road game times, click here. Remembering 2013: What is Brett Tomko doing here? The dreaded off-season has arrived. But fear not, despite news being a little slower this time of year, we have plenty of content to keep you occupied here at BlogToBlogChamps. Each Monday, we’ll publish a feature from the 2013 York Revolutionary Times, the official game day magazine of the York Revolution for you to re-enjoy, or read for the first time in case you missed it at the ballpark. This week, we look back at why exactly starting pitcher Brett Tomko chose to play the 2013 season for the Revolution at 40 years old, after pitching in 14 Major League seasons. Brett Tomko is a baseball player, and a household name for baseball fans. But when you approach him to talk baseball, it’s hard to stick to that topic. He only wants to talk family. The 40-year-old Tomko, a professional since 1995, views the game a little differently with his wife Julia and their three-year-old twins Jack and Ty in tow on this cross-country adventure. He wouldn’t have brought them 3,000 miles from their Southern California home to York if he thought he couldn’t make it back to the big leagues one more time. But if anyone has gained the proper amount of perspective on how to appreciate family while dealing with the rigors of a baseball season, it’s Tomko. 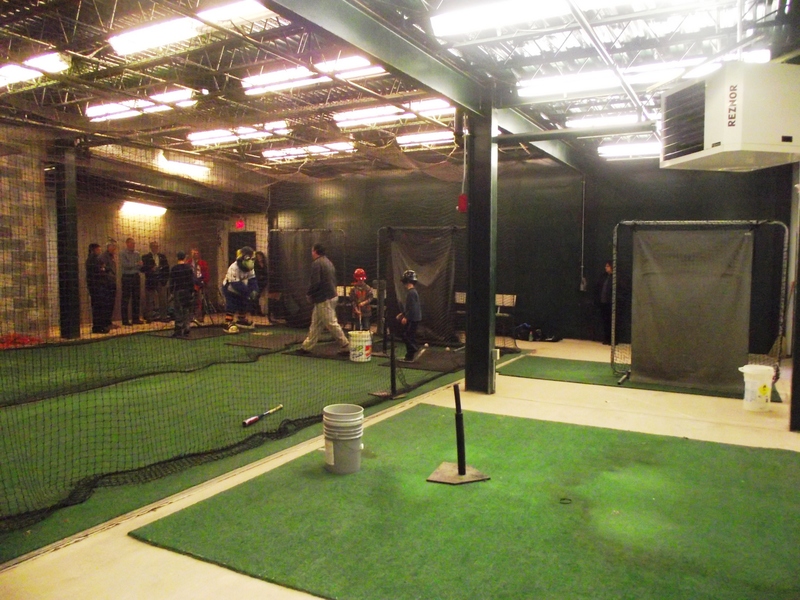 The batting cage facility at Santander Stadium has been fully renovated, as the space is also housing the new YMCA “Diamond Academy” for fall and winter instruction for younger amateur players. The space went from one lane to two full lanes, and is surrounded by individual work stations to hit off tees, flips, etc. Upgrades to the lighting were also made, in addition to pitching machines. I have been to every Atlantic League stadium other than Sugar Land thus far, and in my humble opinion the York Revolution now have by far the nicest batting cage facility in the league. In fact, the space is probably nicer than most in professional baseball. For more on the new YMCA Diamond Academy, click here.